Kitchener Camp – 1 August 1939 to 22 January 1940. My father was born on 22 August 1905 in Frickhofen (now Dornburg), Hesse, Germany. He was educated in the local school for eight years. The village had six Jewish families; my father’s ancestors can be traced back to the mid eighteenth century. All appear to have been Viehhaendler (livestock traders), except for his father Samuel who was a Metzger (butcher) and supplied the local Jewish community with Kosher meat. Hugo’s father was married twice. Hugo had a total of five step-siblings and an elder sister. Upon his father’s death in 1927, Hugo sold the family home, apparently moved away, and plied his Viehaendler trade around the Cologne area, venturing as far as the Dutch border at Brüggen. I know nothing of his life during this time, but at some point, he met his future wife Selma Berger. He did tell me that he conducted his business at night, driving cattle to the next-day market for friendly farmers who left their animals in their fields. 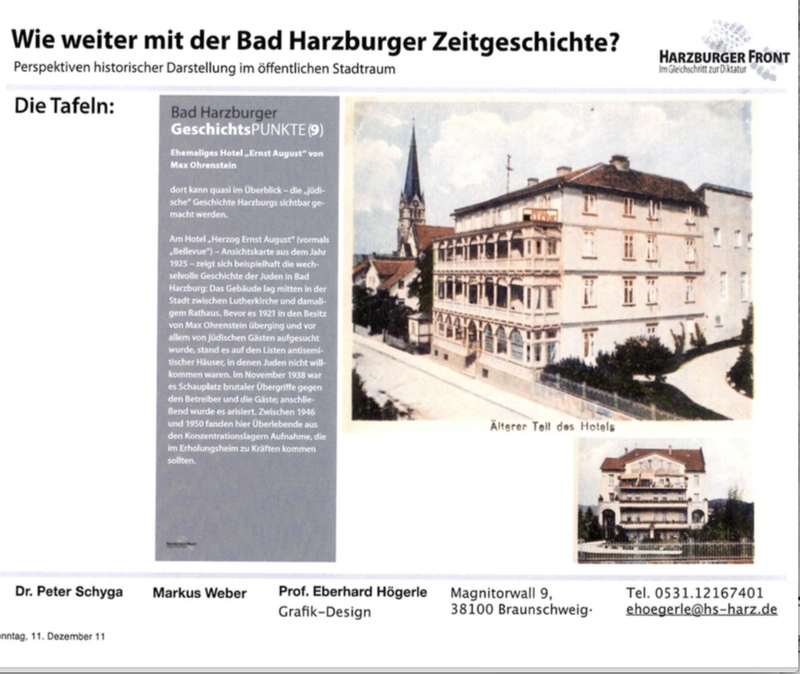 I pick up my father’s trail on 9 November 1938, when he is arrested at the Hotel Herzog Ernst August, formerly the Bellevue, in the spa town of Bad Harzburg in the Harz mountains. How he came to be there I have no idea. His arrest papers refer to him as servant. The hotel was a popular Jewish-owned and Jewish-run establishment in the 1920s and 1930s. Along with other occupants of the hotel, including a wedding party, he was taken to the Rathaus where other detainees were assembled. The women and children were sent home, and between fifteen and twenty men were transferred by the Braunschweig Gestapo to Wolfenbüttel prison where they joined a further 130 men. On the 11 November, Hugo, together with his companions, was transferred to Buchenwald KZ, where he remained until 12 April 1939. Given the NS policy at the time, Hugo spent far longer in Buchenwald than most of the detainees. This may be because he lacked money and or documents to arrange his release. 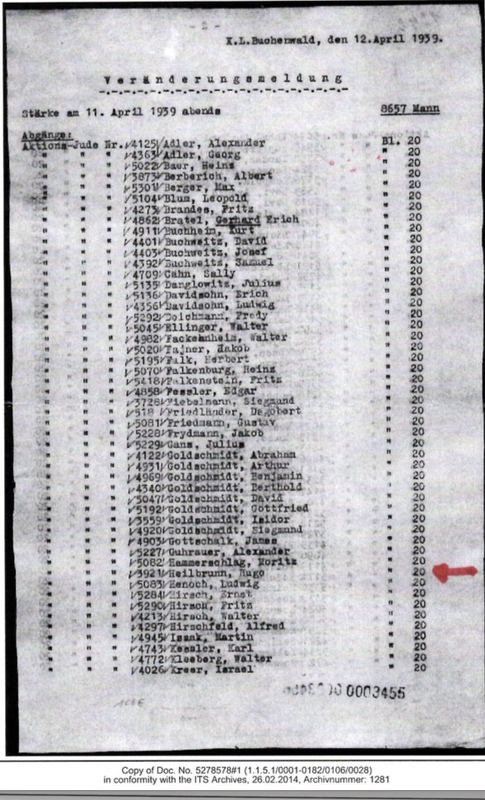 Upon release from Buchenwald, Hugo returned to Cologne, presumably to the house that Selma shared with her married sister at 37, Luxemburger Strasse; this is shown on their marriage certificate dated 6 June 1939. I do not know how my father availed himself of the ability to leave Germany, other than through the usual RV channels. The plan was that he would sail to New York via England and then arrange for Selma to follow. 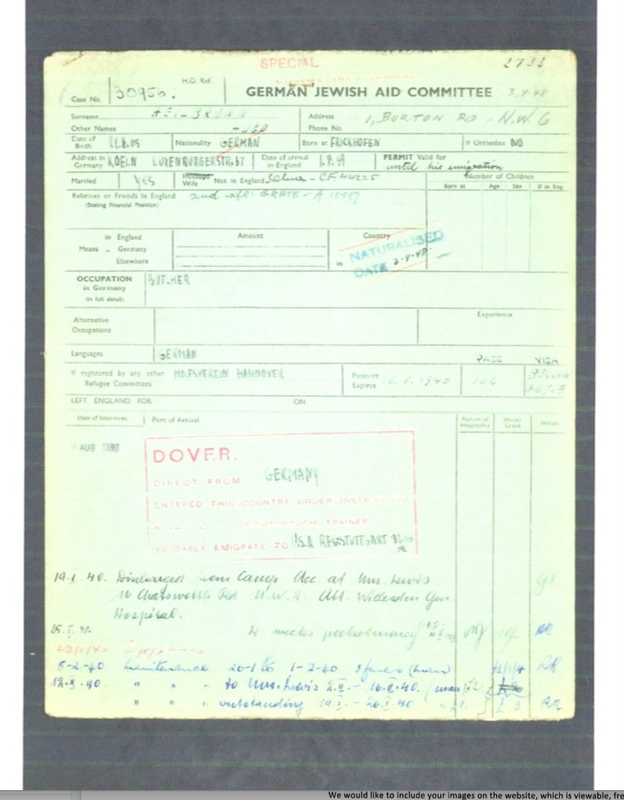 This is how he came to be in Kitchener camp, where he arrived on 1 August 1939, presumably having reached Dover the same day. 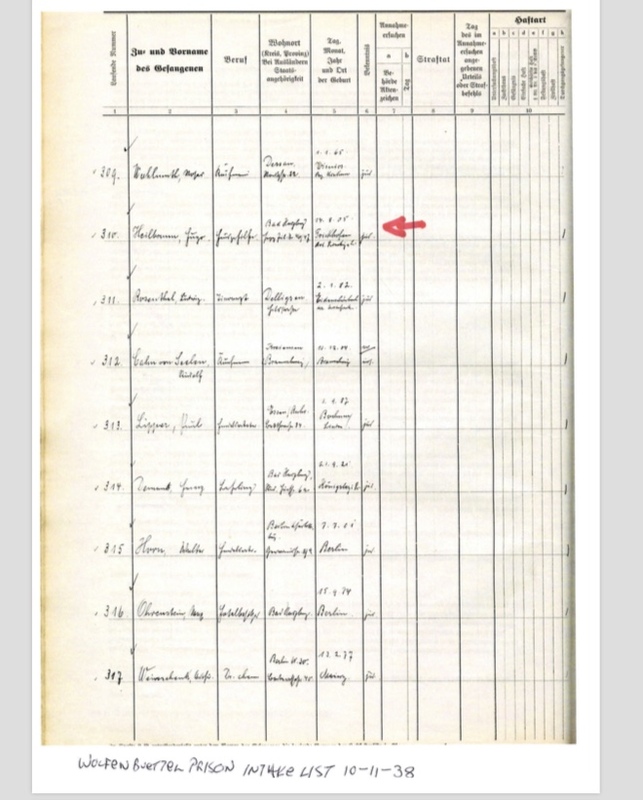 He is listed at this location on the 1939 special census. Sadly, the War intervened, and he was not able to make the crossing from Liverpool. His wife remained in Germany and died in the Holocaust; she was sent to the Łodz Ghetto in 1941 and was murdered in nearby Chełmno in 1942, along with her mother, brother, and twin sister’s family. My father didn’t tell me much about his time at Kitchener Camp other than that he was in ill health when he arrived and that he helped out on farms – it was harvest time in the orchards. 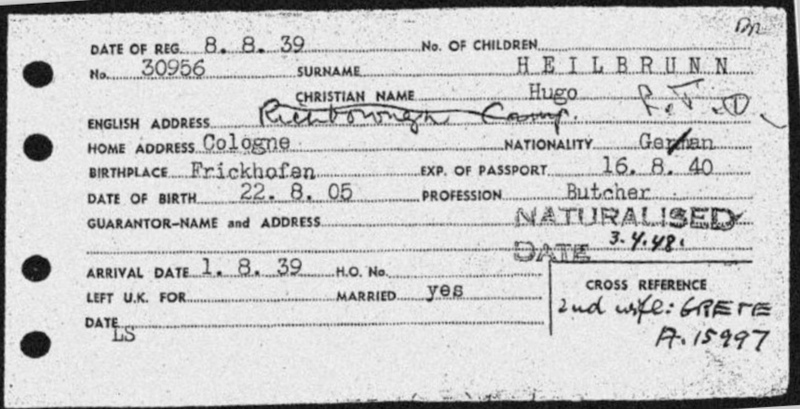 Unlike some others, Hugo was allowed to leave and move to London, which he did on 22 January 1940. I believe he stayed with a relative. He moved three times during 1940, ending up at 39 Belsize Square, where he had his own room and where he remained for over five years. He spent much spare time at the Cosmo café where he became a regular Sunday morning customer well into the 1960s. In London, he found work as a warehouseman in a small company called G&K Leathers Ltd, based on Goswell Rd, London. From doing family research, I discovered that he was a distant relative of Mr F Gutenstein – the G in the company’s name; the other owner being a Mr Kissin. Both were exiles from Germany and came over well before my father. He remained there until he retired in 1970. I think the reason he remained there is that his poor English and is inability to write in the Latin script held him back. I grew up in a household which spoke only German and was my father’s official scribe. During those early years in England, the German Jewish Aid Committee supported him. Emerging from the records, it is clear that he was in ill heath and that he was a firewatcher. He met my mother during the war as she too lived in Belsize Square and, at some point, apparently worked in Goswell Road. She had fled Vienna in April 1939 and was initially in domestic service in Herne Hill. She then trained as a power machinist and worked as such during the war. They married on Empire Day – 24 May 1946. They were naturalised in 1948.